For a few years now, the best available hot tubs have often come equipped with countless innovative features such as highly targeted hydrotherapy jets and in-built water purification systems. However, this hasn’t stopped HotSpring World from pursuing new and novel technologies to improve the hot tub experience for existing and would-be owners. So, what are the latest cutting edge hot tub technology trends currently taking the industry by storm? In addition to the initial purchase price, the ongoing running costs of a hot tub must be a top priority for prospective owners. Thankfully, energy efficiency is at the forefront of HotSpring World’s forward-thinking too. A common problem that many manufacturers encounter is the high levels of salt required for water sanitation in salt water systems. Along with the potential health implications, too much salt can damage crucial components, such as heaters and fittings made from metal. However, HotSpring World has developed the patented ACE salt water sanitation system, which generates powerful natural cleaning effects while simultaneously, and significantly, lowering the salt content of the water. By monitoring the spa size and use level, the ACE Salt Water System automatically produces the precise amount of oxidisers and natural chlorine needed to maintain a clean and safe environment. The target salt level of water when using the ACE system is 1000ppm, which is comparable to drinking water and essentially undetectable by taste or smell. Integrated sound systems aren’t especially revolutionary when it comes to hot tub technology, but the proliferation of smartphone and tablet use has caused manufacturers to adjust their approach accordingly. 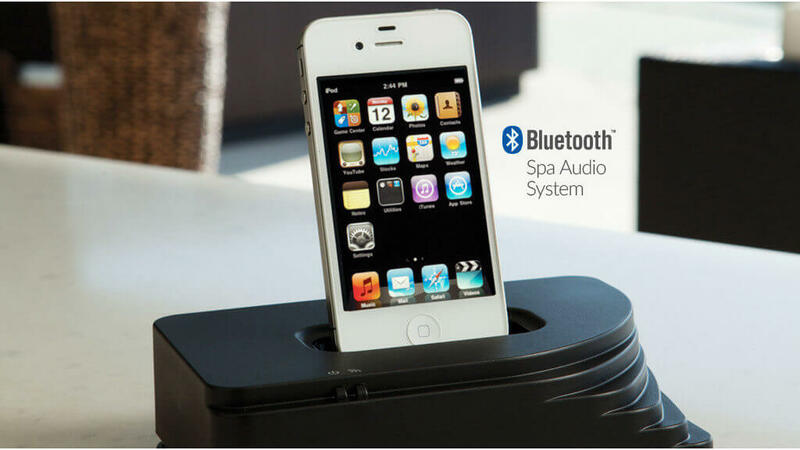 For example, wireless sound systems from HotSpring World are now available which enable owners to connect an audio source to their hot tub via a dock, seamlessly integrated into the cabinet. Music tracks and volume are then easily adjusted via the hot tub’s control panel or an optional remote control. Televisions that can be attached to a hot tub’s cabinet aren’t particularly new either, but waterproof and temperature resistant technology increases year-round practicality. Once again, lighting has been a feature in hot tubs for many years. However, we realise that far from being a gimmick, lighting can have a significant and positive influence on the overall hot tub experience. With HotSpring World’s Luminescence four zone multicolour lighting system, you can create a theme that matches your mood. Lights can be adjusted underwater as well as for the bar top and pillows. Great for creating the ambiance that is just right for your romantic nights alone together! But perhaps most impressively, this system enables you to effectively change the colour of the water flow and features, making them beautifully backlit with subtle LED lighting.